As with all devices formally announced today at Google's event (so far), we already knew about the Chromecast Ultra. The name and price was leaked two weeks ago, and not long after, the first images of the device appeared. After 30 million Chromecast devices have been sold, Google has formally announced the Chromecast Ultra. 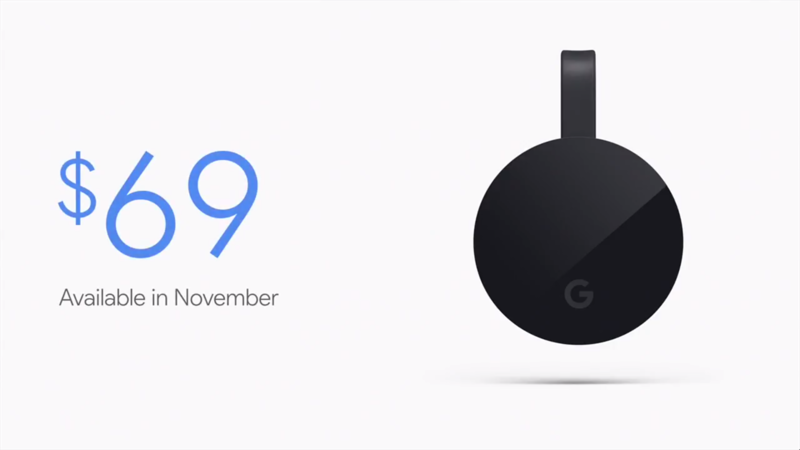 The new device has the same hockey puck shape as the current Chromecast, but now with a 'G' logo in the place of a Chrome design. As expected, the Ultra will be capable of 4K playback with HDR and Dolby Vision. Google claims the Ultra is about 1.8x faster than existing models, and features "major WiFi improvements." Perhaps the biggest surprise is an Ethernet port on the power brick, no doubt allowing for smoother 4K streaming than your typical congested WiFi network. The price of the Chromecast Ultra is identical to the recently-released Mi Box, which not only also packs 4K video with HDR, but is a full-fledged Android TV device. I suspect customers not interested in the Android TV platform, or simply unfamiliar with Mi products, will opt for the Chromecast Ultra. To coincide with its debut, Google will begin offering 4K content through Google Play Movies. The Ultra will be available in November for $69, and you can pre-order it right now at the Google Store.